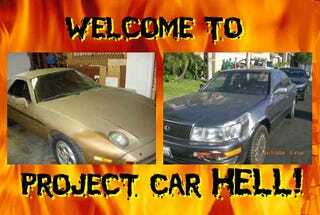 PCH, V8 Imports You Should Totally Run At LeMons Edition: Porsche 928 or Lexus LS400? Not very shockingly, the Mercedes-Benz 450SEL beat up on the Pontiac Bonneville in our 6.9 Liters Of Misery Choose Your Eternity poll on Friday, no doubt because voters were counting camshafts or dollars in the original purchase price or something. Today we're going to have the traditional post-24 Hours Of LeMons PCH, only instead of letting you choose between the cars that finished #1 and #2 (in this case, a Supra and a Jetta) we're going to choose between two cars we really, really want to see someone bring to a LeMons race. They were expensive when new, featured sophisticated DOHC V8s and rear-wheel-drive, and came equipped with dizzyingly complicated electronics and plush luxury gear… yet it's possible to pick either one up for a LeMons-friendly price today! We've seen the Porsche 928 in the Hell Garage before; in fact, we've had more 928s here than any other car! Why is that, you ask? They were insanely expensive, insanely hard to fix, and insanely (for their time) fast, and non-perfect ones are available for the same insanely low price as a 15-year-old Corolla, that's why! It goes without saying that everyone associated with the 24 Hours of LeMons race is praying for a 928 to show up, because it may well be the perfect car for that race: looks like a great race car on paper, glowing with cocaine-dealer aura, and 99.999% likely to disintegrate on the track. Now, we've never seen a running one for 500 bucks, but any 928 should contain sufficient eBay-able components to make cars in the $1000-$1500 price range fit the LeMons budget. We've found this '78 928 (go here if the ad disappears) located in Southern California- just in time for the Arse Freeze-A-Palooza race in December! The seller says he "was told by my mechanic that all it need to start running was a new fuel pump," so there ya go! It should fire right up once you rig up a junkyard pump out of a 280ZX (we're pretty sure a Porsche pump sells for $11,987 and requires 26 weeks ship time). And look at how nice it is- you're sure to find a gold mine of parts to sell! Why don't racers ever run big rear-drive Japanese luxury cars at the 24 Hours of LeMons? Japanese cars are reliable, right? Forget about those head-gasket-popping Integras and CRXs, those breadstick-strength control arms of the RX-7s, and the beercan-grade construction of the FX16 Corollas! Instead, slide behind the wheel of an early-90s Mazda 929, Infiniti Q45, or Lexus LS400 and enjoy repeated breakdowns certain victory at Thunderhill while showing your sense of style and class. Can you really get such a fine automobile for a LeMons-appropriate price? That's like asking "Do Yakuza hit men have tattoos?" Of course you can! Why, I was able to find this '91 Lexus LS400 (go here if the ad disappears) after just a couple of minutes searching California Craigslist ads. The seller wants 800 bucks, but that ain't gonna happen, not with that crumpled sheetmetal and 190K miles on the clock; between the $600 you'll pay for it and the $400 worth of stuff you'll sell on eBay, this car might as well have "THUNDERHILL EXPRESS" painted on it right now. You'll get a 256-horse V8 (more than the Crown Vics that did so well in Toledo) and a weight you'll be able to get below 3,000 pounds once you rip out all the luxury crap, giving you the kind of performance that will have racers in lesser cars loaning you tools in the pits pounding their steering wheels with rage as you roar past. Oh sure, so-called veteran racers might point out that non-Detroit automatic transmissions- particularly those with nearly 200,000 miles on them- usually blow up in endurance races, and maybe you'll cut a crucial engine-control wire or two as you gut the interior, and the LS400's vast bulk might win it a date with the People's Curse excavator after you punt a few subcompacts into the tire barriers, but winners don't dwell on the negative!